During the working week there are 2 things I look forward to. The first one is obvious; going home at the end of the day. At a very close second is Lunch. I love Lunch to bits as it breaks up the day and also replenishes the energy drained from going through the dreaded inbox. Working in Raffles Place means that it gets super crowded and you can end up paying a lot for Lunch despite there being a lot of options available. Most of the time I would avoid Boat Quay for fear of getting squandered out of my Lunch money. That was until I came across Katanashi; a small little Japanese Don place (bowls of Rice served with various toppings) and now I'm hooked. 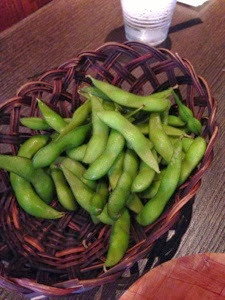 At $12 for a set consisting of Salad, Miso Soup and a Bowl of Rice, you can't go wrong on price. 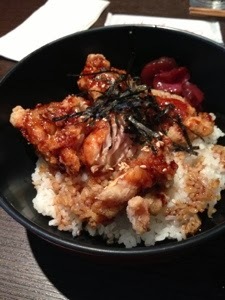 I usually order the Karaage Don (fried Chicken) or Chicken Katsu Don (Cutlet). Both are awesomely good, nicely battered or crumbed with a great crunch. 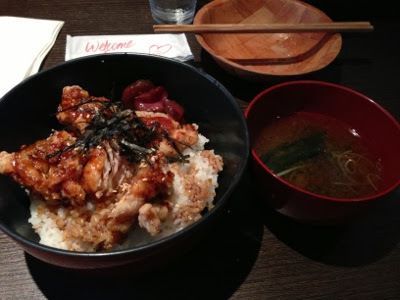 The light Teriyaki sauce also flavours the Rice nicely. 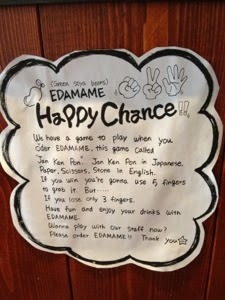 For the Chicken Cutlet, I enjoy the dash of Mustard they give you for a bit of a hit ie "Nom". The Salad is simple; greens with a Sesame sauce and the Miso Soup is pretty good for washing the Rice down too. 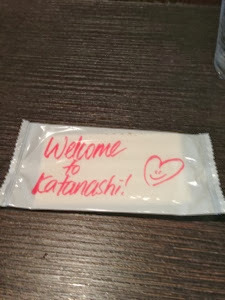 Katanashi is a great little place for some tasty food and the price is pretty good. Try and sit inside by the Kitchen counter and you can see the team work their magic. A great little touch are their packets of tissues, they write & draw their own little cartoons on them for you. Check Katanashi out. I'm sure you won't be disappointed. 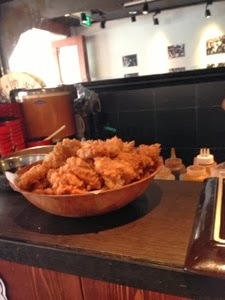 Katanashi can be found at 77 Boat Quay.